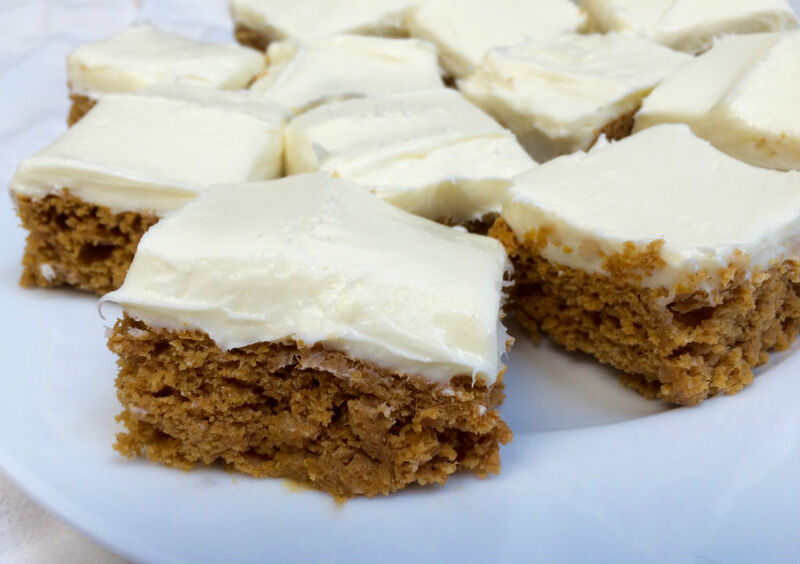 These super easy pumpkin spice brownies are a new favorite of mine. I call them a brownie, though I know a bar would be the proper description. But since I first tried the two ingredient brownies using pumpkin and cake mix, brownie seems appropriate here too. It still amazes me how quick it is to make either of these recipes. 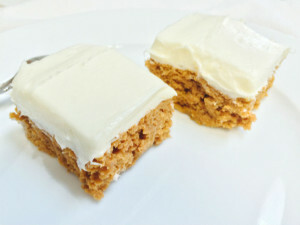 For this one I used a spice cake mix and one 15 oz can of pumpkin. The very first time I made them I had a large can so I made one of each. It takes a half can if you are using the large size. It doesn’t even take a mixer, until you get to the frosting stage. Like the brownies, they are very good sans frosting, but with the frosting they are out of this world. A pan bakes in twenty minutes. It needs to cool before you frost it. Since it contains cream cheese, be sure to refrigerate the pan when you are done unless you are freezing them. This cream cheese frosting recipe is the best I’ve tasted. Rich and creamy and such a delightful flavor. Be sure to allow time for the cream cheese and butter to soften before you mix the frosting. Also, it’s easier to mix if you use a big bowl for the frosting. By the way, they do freeze beautifully. I love to freeze into a serving or two so I can grab something sweet when I get a craving. That makes them a terrific dessert to take on a picnic. Start with them frozen and they will be thawed when you are ready for them. The recipe works for muffins too if you prefer. Frosted or not, they are a tasty treat. Good for breakfast, brunch, a snack or dessert. It makes me want to try pumpkin with other flavor cake mixes. I’ll let you know how that goes. 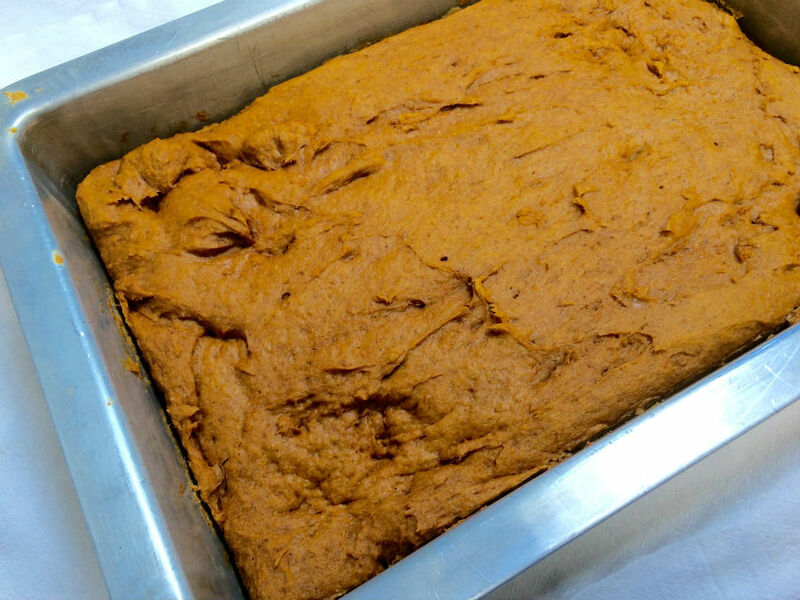 Mix 15 oz pumpkin with the spice cake mix. Mixture will be quite thick. Smooth into pan, then bake at 400 for 18 to 20 minutes. Once cooled, you can frost if you like. Mix cream cheese and butter together thoroughly. Add vanilla, then gradually add in powdered sugar. Once brownies are cooled, frost. The cream cheese frosting should be refrigerated. Each of these offer more than the appliance itself too. The handy mixer works fantastic, but also comes with the snap on case for such easy storage. It is much neater—and space saving—to have the cord and beaters right there in the case instead of scattered everywhere. The mixing bowls are practically indestructible in stainless steel, but the lids with this set are so helpful. When you need to refrigerate over night or a few hours, no need to hassle with plastic wrap or foil. You can even stack with the lids. Similar for the bake pan too. A cover is important when you are baking. For refrigerating, for countertop, or for traveling. The rise in the cover protects frosting and toppings too. Three favorites definitely. Merry, Susan recommended this recipe to me and it sounds fantastic! I just “yummed” it on Yummly. Looking forward to trying it! Thanks Margaret. It’s a favorite. Love the frosting!